Richard Clark Lindsay was born in Minneapolis, Minnesota, on October 31, 1905. He graduated from West High School in 1924 and attended Carlton College and the University of Minnesota. On June 11, 1928 he was appointed a second lieutenant in the infantry reserve and on June 28 he enlisted as a flying cadet in the Army Air Corps. During his cadet period he attended the Primary and Basic Flying School at March Field, California, and graduated in June 1929 from the Advanced Flying School at Kelly Field, Texas. 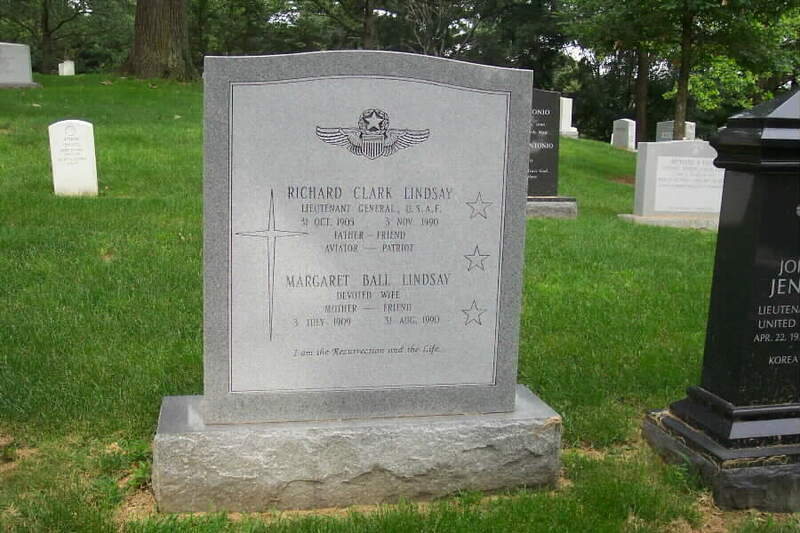 He was commissioned a second lieutenant in the air reserve upon graduation from Kelly and as a second lieutenant in the Regular Army Air Corps on September 14, 1929. Lieutenant Lindsay's first assignment was to the 91st Observation Squadron at Crissy Field, California He served on temporary duty at Mather Field, California, during the first provisional wing maneuvers at that station from April through May of 1930, performing various duties in the Support Squadron. In October 1930 he entered the Air Corps Tactical School, Maintenance Engineering Course, at Chanute Field, Illinois. He graduated the following June and was reassigned to Crissy Field where he rejoined the 91st Observation Squadron, serving first as assistant and later as squadron engineering officer. In January 1934 Lieutenant Lindsay entered the course in Advanced Aerial Navigation at Rockwell Field, Coronado, California. This course was interrupted when the U.S. Army Corps was designated to handle the airmail and he served as a pilot flying the mail on Route 5, between Portland, Oregon. ; Pasco, Washington; and Boise, Idaho, in the Western Zone of the United States. In July 1934 after completing numerous flights and acting as station control officer at Pasco, Wash., he returned to the 91st Observation Squadron at Crissy Field. Lieutenant Lindsay returned to Rockwell Field in October and completed the Advanced Navigation Course in November. In May of 1935 he was transferred to Hamilton Field, California, where he served with the 9th Bomber Squadron and the 88th Observation Squadron (long-range) as navigation officer. In January 1937 he found himself in Hawaii where he served in the 7th Service Squadron at Schofield Barracks, the 50th Observation Squadron at Luke Field, and the 18th Wing at Hickam Field. While at Luke Field he served in navigation and operations staff assignments and during this period conducted a navigation school for selected officers in the Hawaiian Department. In late 1938 and early 1939 he served first as operations officer and then as assistant operations officer of the 18th Wing at Hickam Field. Observation Group at Natchitoches, Louisiana. After his tour with the 97th Observation Squadron, during which time he received his promotion to captain, he was assigned to the 22nd Observation Squadron at Brooks Field, Texas, where he conducted a course training combat observers. In March of 1941 the combat observer training was turned over to the Advanced Flying School at Brooks Field and the now Major Lindsay became chief of Section III and later the director of the Ground School and assistant director of training. In November 1941 Major Lindsay joined the War Department General Staff where he was first assigned to the Air Plans Division, serving as member of, and later as the chief of, the African-Middle East Section, where he received his promotion to lieutenant colonel. Then, upon the reorganization of the War Department in March 1942, he served as a member of, and later as chief of, the Policy Division of the Strategy and Policy Group in the Operations Division. In the summer of 1942 he was made a temporary Colonel in the Army Air Forces. In June 1943 he was assigned to the Joint War Plans Committee where he participated in the preparation of strategic studies utilized by the joint and combined chief of staff in determining the operations the allies would undertake in the pursuit of the war. In August 1944 he became chief of the Combined Joint Staff Division of the Headquarters Army Air Forces and was promoted to the grade of Brigadier General. At the time he served as the Army Air Forces representative on the Joint Staff Planners of the Joint Chiefs of Staff. Lemay during the final days of the war against Japan. In December of 1945 General Lindsay moved to Manila as assistant chief of staff, plans, for the Pacific Air Command and was assigned in January 1946 as commander of the 316th Bomb Wing, 8th Air Force (later the first Air Division), Kadena Air Base, Okinawa. In March 1947 he was transferred to Tokyo, Japan, where he became assistant chief of staff for intelligence for the Far East Air Forces. In August 1947 he was returned to Washington as chief, Policy Division, in the Office of the Assistant Chief of Air Staff for Plans and Operations at Army Air Forces headquarters just before it became the headquarters of the U.S. Air Force. In this capacity he served again with the Joint Chiefs of Staff as the Air Force member of the Joint Staff Planners (later the Joint Strategic Plans Committee). That November he was promoted to Major General. In April 1948 General Lindsay was appointed deputy director of plans and operations for the U.S. Air Force and the following October was assigned to the Joint Staff as deputy director for strategic plans in the Office of the Joint Chief of Staff. In this capacity he continued as a member of the Joint Strategic Plans committee but as a result of his responsibility as chief of the Joint Strategic Plans Group of the Joint Staff he became chairman of that committee. In July 1951 he was assigned as the standing group liaison officer to the council deputies of the North Atlantic Treaty Organization. The standing group was situated in Washington while the council deputies were in London. With the post-Korea build-up of the Air Force, General Lindsay became commander of the 3560th Air Force Indoctrination Wing at Sampson Air Force Base, New York, in June 1952, where he supervised the basic training of many thousands of Air Force recruits. This organization was redesigned as the 3650th Military Training Wing, Air Training Command, in March 1953. General Lindsay returned to Air Force headquarters in April 1954 as director of plans in the Office of the Deputy Chief of Staff, Operations, and after almost three years in this assignment he was named the assistant deputy chief of staff, Operations, on February 11, 1957. In May 1957 he was promoted to the grade of Lieutenant General. On August 1, 1957 he was appointed commander of Allied Air Forces Southern Europe (NATO) with headquarters in Naples, Italy. General Lindsay's main hobbies are photography and recorded music. His photographic ability is professional rather than amateur. His musical interest varies from the classical to the popular. He is a high fidelity fan and a collector of tape recordings. He is an avid fan of the little theater, having participated in these activities during his college days. General Lindsay has a broad range of interests, from military plans and operations to political and economic affairs. His versatility of interests covers both the arts and sciences. General Lindsay is a member of the Academy of Political Science, the Academy of Political Arts and Sciences and the Council on Foreign Relations. General Lindsay is a moderate liberal. Tolerant of the views of others, he wishes to hear all sides of a question before making up his mind on the issues involved. He possesses the faculty for a personal interest in people, both officially and socially. He emphasizes and expects exactness in others. He wants recommendations developed as a result of thorough analysis and investigation of the problem and does not care for generalizations. Looks for results. General Lindsay made large contributions to the discussions leading to the publication of Henry Kissinger's book "Nuclear Weapons and Foreign Policy" and the Rockefeller Foundation Report on "United States National Security Policy." The General retired from the Air Force on April 30, 1960, and he died on November 3, 1990, at a Glendale, California hospital. He was 85 years old and died of heart failure, said his son, Richard B. Lindsay of Fremont. Until 1969 he had worked as a consultant to military contractors. In addition to his son, survivors include a daughter, nine grandchildren and eight great-grandchildren. There was apparently some controversy about whether the ashes of his former wife (from whom he was divorced) could be buried with him. After heated discussions with his son and military officials it was apparently approved. 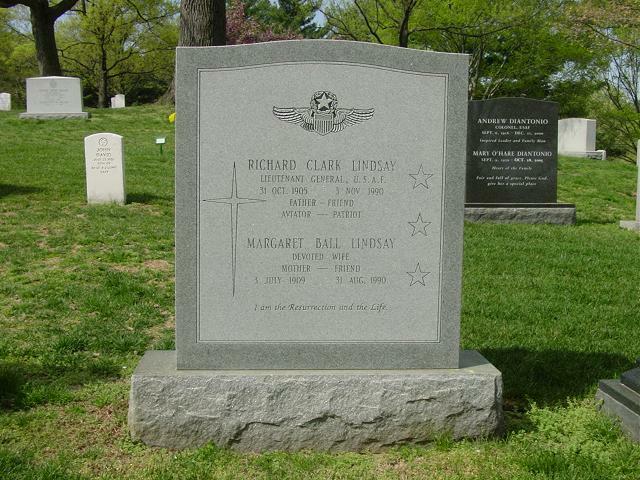 General Lindsay was buried with full military honors in Section 30, Grave 859, Arlington National Cemetery. His wife, Margaret Ball Lindsay (3 July 1909-31 August 1990) is buried with him.